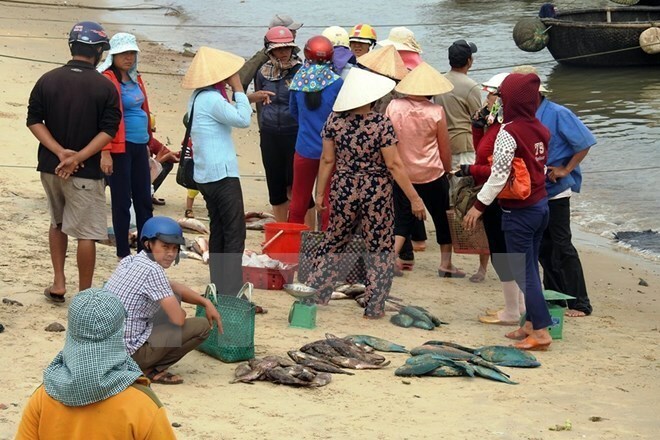 Hanoi (VNA) – Prime Minister Nguyen Xuan Phuc has directed the handling of stockpiled seafood in the four central provinces which were affected by maritime environmental incident in 2016. The PM promulgated decisions in September 2016 and in March 2017 stipulating the level of compensation for affected localities of Ha Tinh, Quang Binh, Quang Tri and Thua Thien-Hue. Based on the report of the four provincial People’s Committees and proposals of the Ministry of Agriculture and Rural Development, the Ministry of Industry and Trade, the Ministry of Finance, the Ministry of Natural Resources and Environment, the Ministry of Health and the Government Office, the PM agreed to support 100 percent of the value of stockpiled jellyfish products and 30 percent for other aquatic products. The maximum volume of stockpiled seafood in the four central provinces is 5,453 tonnes worth 242.6 billion VND (10.7 million USD), including 2,708 tonnes in Ha Tinh (150.2 billion VND), 1,101 tonnes in Quang Binh (48.5 billion VND), 1,501 tonnes in Quang Tri (42.7 billion VND), and 143.1 tonnes in Thua Thien-Hue (1.2 billion VND). The PM also agreed to provide maximum financial assistance of 341.3 billion VND (15.1 million USD), including 121.8 billion VND for Ha Tinh to support 4,244 labourers in coastal areas and 2,954 employers and employees at fishing logistics services facilities; 214.4 billion VND to support 15,022 labourers involving in processing seafood and fishing logistics services; 320 million VND for Quang Tri to support the aquatic breeding centre; and 4.73 billion VND for Thua Thien-Hue. The compensation must be conducted in a public and transparent manner, he stressed.